This is the last Costa Rica blog post....FINALLY! I need to get through these posts because I have about 5 million other posts I need to write. So, let's do this. This was our last full day in Costa Rica. We were flying out way too early the next morning from San Jose, so we had to make that really short 6 hour drive from Playa Hermosa back to the airport area. We decided to leave early early in the morning and take a little detour to Monteverde, an amazing little mountain town unlike anything you've ever see, including a settlement of Quakers. The drive up to this town was incredible. The dirt road the whole way was not so incredible. 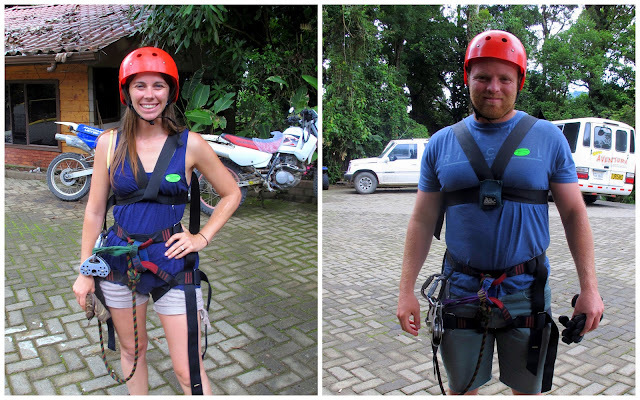 When we got to Monteverde, we explored a bit, then went on the longest zipline in Latin America. The course took 2 hours to get through. There were different ziplines at different heights and lengths for us to cross, including one that is a mile long. For the two really long stretches of the zipline, we went across Superman style. Nick took this picture from the zipline, as he was coming across it. Then he fumbled with the camera as he was coming in. And now my sister is having a heart attack seeing what could have happened to her camera. Don't worry Kim! It was around his neck and hooked through his helmet strap. The grand finale of the course was this Tarzan swing. It was a free fall from this platform and then swinging back and forth once the rope finally catches you. It was my favorite part. And then a storm rolled in as we were driving down the mountain and back to San Jose, where there are no addresses AT ALL. That's fun when you have no idea where you are going. So that's it. We left early the next morning to come home. We were wishing we had stayed longer, but that would have meant more blog posts, so lucky for you, we didn't. But we will go back someday. We LOVED it! And now begins wedding week! My sister gets married in 6 days!! I don't know how much I'll be able to blog this week because there are a million wedding things to do and my whole family is here, but I will be back to blog about the wedding shower, the bachelorette party, and the amazing fundraising dinner that we had where we raised SO MUCH MONEY for our adoption. Wait until you see the update for what we have raised in the sidebar!! This post reminded me of my mission trip to Honduras with my brother. It was awesome! I had the pleasure of ziplining, even in the rain;) The slippery cable made the ride faster. More scarier, sure...haha...but fun:D My brother opted out...party pooper. We also had the privilege of staying the night in an orphanage (a long story - very adventurous). Anyways, loved the post!